Making bath salt is an easy and gratifying craft that will transform your bath from an everyday experience to a spa-like retreat. In addition to ingredients like baking soda, starches, moisturizing and essential oils, there are many types of salts that can be used in bath salts and one well-known ingredient that is actually not a salt. Additionally, iodized table salt is a salt, but should not be used for bath salts. It can cause a skin reaction and isn't recommended. The type of salt you select for your bath salt project will impact the final product and feel in the bath. For example, fine grain salt and will dissolve completely in the bath. A larger grain salt will take longer to dissolve and some grains may remain in the bath. Other salt choices will impact the mineral content of the bath. For example, Himalayan sea salt will create a very mineral heavy bath. Salt comes in many forms. Iodized table salt, sea salt, kosher salt, pickling salt, and more exotic salt like Himalayan salt are just a few of the many varieties. The primary ingredient in all of these is sodium chloride. However, their differences lie in the size of the crystals, origin, drying style, and any other ingredients that are added to the salt. Iodized table salt is highly refined and has a trace amount of iodine added to the salt. It is finely and uniformly ground and may also have some anti-caking ingredients added to it. Avoid this type of salt when making bath salts. When bathing, some of the salt is absorbed by the skin and any sensitivity to iodine will cause a skin reaction from the salt. 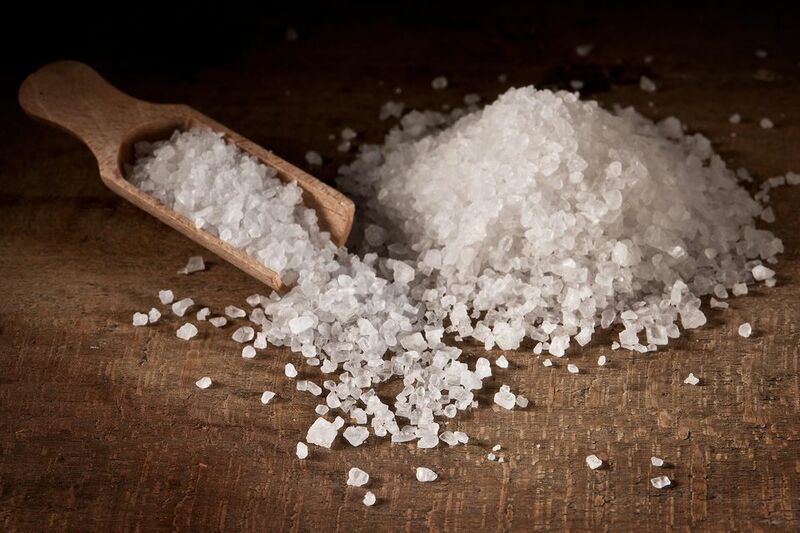 Cooking salts include kosher salt (larger grains), pickling salt (very fine grain), and coarse or rock salt. They are distinguished by the size of the grains of salt and the absence of iodine. These are inexpensive and readily available options that are fine to use for homemade bath salts. Sea salt is distilled directly from sea water and contains some trace minerals naturally found in the sea water. It comes in a number of grain sizes and usually doesn't contain any additives. The color and texture of sea salt vary widely due to the local clay, algae, and other deposits found in the water the salt is harvested from. Some sea salts are pinkish gray, others are black. In addition to bathing, sea salts are popular seasonings for cooking. The wide range of types also yields a range of flavors. Exotic and/or luxury salts include gray, Celtic, Dead Sea, Himalayan, Hawaiian, and other types of salt. They are still considered salt, but may not even have sodium chloride as their primary ingredient. The various unique minerals and elements in the salts impact the color, shape, size, and special qualities of the salts. Dendritic salt is a commercially manufactured product and not a naturally harvested salt. It consists of highly purified sodium chloride and is crystallized under special conditions by a machine. Dendritic salt is a popular bath salt option because it has a greater surface area than other salts. Fragrance, essential oils, or color will adhere better to this type of salt. It also clumps much less than other salts. Epsom salt, while very well known, is not actually salt. It's a naturally occurring pure mineral compound of magnesium and sulfate. It's a popular type of salt for creating homemade bath salts. Widely available and inexpensive, it can be used for a number of household crafts or DIY remedies. Iodized table salt is not recommended for bath salts. Any of the other salts are fine in your homemade bath salts. When making bath salts, choose the type of salt based on how you want the product to look, your budget, and what other ingredients you'll be adding to the salt. Exotic or luxury salts will likely cost more than some of the more common salts. Additionally, depending on the other ingredients you add, you may want a finer or coarser salt. In addition to salt, you can add other ingredients like milk powder, baking soda, natural starches, essential and fragrance oils, herbs, or flower petals into a wonderful bath salt creation. Besides ingredients, focus your recipe on different intended outcomes, like relaxation, invigoration, or even congestion relief. When packaging homemade bath salts, choose a durable option like a sealable bag or jar. It should be easy to open, but also must seal tightly to protect the salts from moisture and spillage. If you are sharing the homemade bath salts with others, label the bath salt package with all the ingredients. This will help bathers know what type of bath salt to expect (relaxing, energizing, etc.) and will allow them to avoid any ingredients that may cause an allergic or unpleasant reaction.